An administrator is a personal representative designated by the probate court to settle the decedent's estate when the decedent has died intestate (without a will), or has failed to name an executor in a will. Use an administrator's deed to convey fee simple title to a grantee, who is either a beneficiary, heir, or buyer). The deed contains covenants that the grantor is qualified to act as administrator of the decedent's estate; is authorized to bargain and sell the property pursuant to the terms of the decedent's will or by order of the probate court; and will warrant and defend the grantee's title against the claims of persons by, from, or under the grantor. 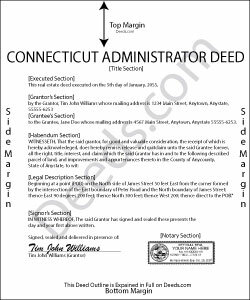 Contact an attorney with questions about administrator's deeds or any other issue related to probate in Connecticut. Thomas E. said: Great, immediate access to everything I needed to assist my client! This is truly a great resource for a Notary Public! I will surely keep my account open, and will refer others as well! Reply from Staff: Thank you for the Kind words Thomas. We really appreciate you! Have a great day. Earline S. said: Total package. Very prompt with complete instructions & example to complete forms. If you don't want to hire a lawyer, this is pretty simple & will bypass probate. Reply from Staff: Thank you, we really appreciate your feedback.